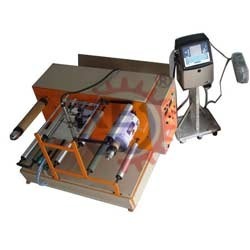 In any paper, film and foil conversing industries, the Winding Rewinding Machine with Inkjet Printer is used widely for on-line printing of Mfg. Dt., Exp. Dt. B. No. etc. using Ink- jet printer or other contact coding machines from Roll to Roll at high speeds & then these printed roll are used in various packaging machines. M.S. CHANNEL FRAME BODY with mechanical clutch & break unwind / unwind system, unwind / rewind shaft & cones for printed material holding cores for printed material cores, alu-guide roller & all other standard accessories. Web Width / Weight 75-500mm. / 50Kg. Max. Max. parent reel dia. 400mm. Max. Rewind reel dia. 400mm.